Why did you choose to study at Goldsmiths College? Its reputation as a place of critical inquiry and radicalism. I was very impressed by their recent MFA degree show and several of their alumni are among my heroes. Your background is in English and literary theory. What led you to study fine art, and how have you found that transition/parallel? Whether through dyslexia or boredom I think it came to a point where words could no longer articulate what I wanted them to. Visual art had long been an interest of mine, but only in the last few years did I decide to experiment with it. The transition was a little scary at first, particularly when I started to officially refer to myself as an ‘artist’ when asked about my occupation — but really I don’t think I was ever not an artist, I just didn’t have the language to know that I was. Can you talk a bit about your practice? I make a lot of work from found material, usually sculptural installations and often incorporating these items into other forms like painting and performance. I suppose the environment I’m in affects me a lot. At the moment my studio is by the tidal creek in Deptford, which feeds into the Thames. I think that proximity to water is significant. I’m very interested in the innocence of certain materials, and of the body, in relation to the environment. In my performances I often position myself in inhospitable or desolate landscapes in order to show the body for what it is, vulnerable and in need of love. I suppose that care and love is a major part of it all. I like to try and make things that challenge hardness: both in attitude and form. Not here. 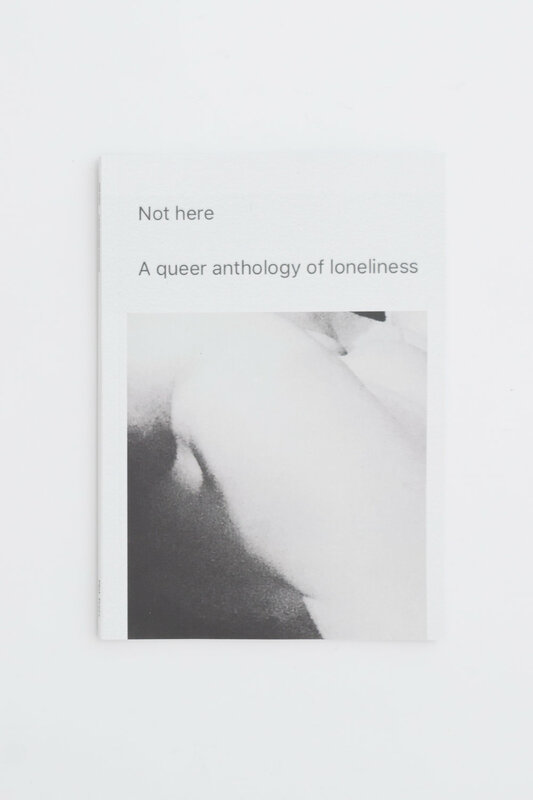 A Queer Anthology of Loneliness was a fantastic debut publication from you not-for-profit Pilot Press. Can you tell us a bit more about the project? What was the catalyst to start it? Being lonely! But also an event to celebrate the re-publication of David Wojnarowicz’s Close to the Knives, at which I read the final few pages. “Smell the flowers while you can”. Those words stuck with me. I’m lonely, so what do I do about it? I was lucky to have had such a brilliant response to the callout, and then to the journey it’s had since. 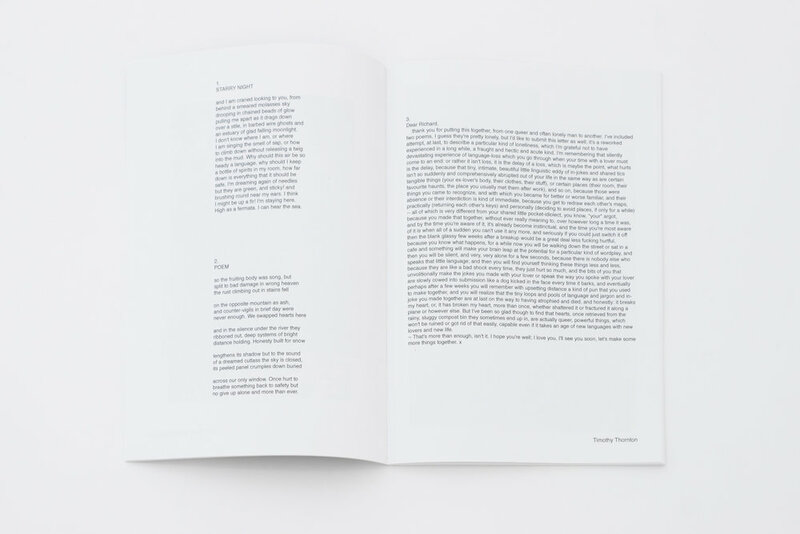 I run Pilot Press in parallel to my practice – I see the communality and celebration of queerness as central to both. And the upcoming second issue? Joy! Oh my God – it’s so hard. To try and feel joy in such awful, awful times. My intention with it was to see if it was possible to get people to respond honestly, as in the first issue, to something that might be difficult to try and pin down. Joy was something I felt like celebrating, or moving towards. As an act of defiance I suppose. I do think caring for yourself and other people is a radical gesture, particularly in a world where the poor and marginalised are so often left to rot. Do you think putting together Not here had an impact on your art practice? Yes, they both inform each other. I like bringing lots of different voices together into one. I suppose that’s what I’m doing with my use of found fragments in my other work. All these lives gone, leaving these tiny traces. I too would like to leave something before I go. I hope my art practice celebrates decay and the fleetingness of life, and allows for it. I don’t believe in the idea of making work that has to last at least 100 years, as a rule – I suppose that’s why I’m at Goldsmiths and not the RA! Any other plans with Pilot Press this year? Just the new anthology for now. I hope to keep the press open to possibility! I’m also publishing a lookbook for an upcoming fashion collaboration with another Goldsmiths graduate, Urara Tsuchiya, which is happening as part of Glasgow International in April, following some of the principles of my use of found objects and her skills as a ceramicist. Watch this space! What are your favourite South East London places? I love the creek at Deptford. I can only imagine its history and what lies beneath its muddy floor, under the shopping trolleys and laughing gas canisters. I also love the gardens of Dulwich Park in summer and the Aladdin’s Cave antiques shop by St John’s station. There’s a lot left to discover.